An elderly disabled woman escaped probable death after quick-thinking passers-by came to her rescue as she faced an oncoming train while crossing a set of railway tracks. Dramatic dashcam footage from the incident in Bergen County, New Jersey was released by Saddle Brook Police Department on Wednesday. 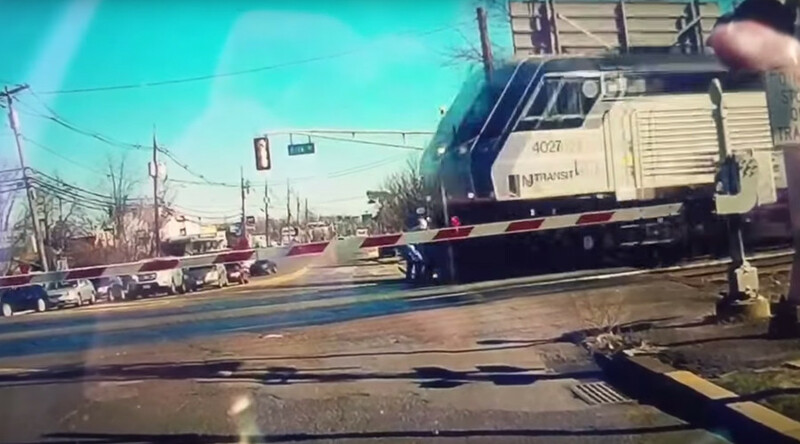 The unnerving video shows one man race across the track just before the barrier comes down while another man rushes over from a different direction to assist in bringing the 89-year-old woman to safety. The woman appeared to be hunched over and was using two canes as she walked. A split second after the pair brought her off the track the New Jersey Transit train is seen hurtling past. The first man to come to the woman’s rescue has been identified as 28-year-old Jonathan Mango. He told CBS News that the woman didn't appear to speak English and was initially scared of him. “I sprinted onto the tracks and I pulled her by the arm. She was scared, like I was trying to do something,” Mango said. The second man has not been identified as he left before police arrived. Police said the woman regularly walks the area and praised the “good Samaritans” for their selfless act. “She certainly had the angels watching over her today and the two individuals, angels themselves without a doubt, saved her from this near disaster,” Saddle Brook Police Chief Robert Kugler said.